Saint Nectaire is an ancient French gourmet cheese from the mountains of the Auvergne. This is a raw milk cheese in France and is brought into the USA made with pasteurized milk of mostly Salers cows. The cheese is made in round flat discs. 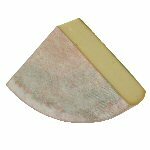 It has a grayish rind with light yellow or reddish patches. The supple paste is pale gold in color and becomes almost runny as it matures and has a sweet and grassy aroma and this is repeated in the flavor which is creamy and only slightly farmyard like. 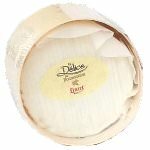 The cheese is semi-soft to firm, though supple, with a moldy smell and a mild flavor. Ingredients: Pasteurized cow's milk, salt, lactic starters, animal rennet, calcium chloride.